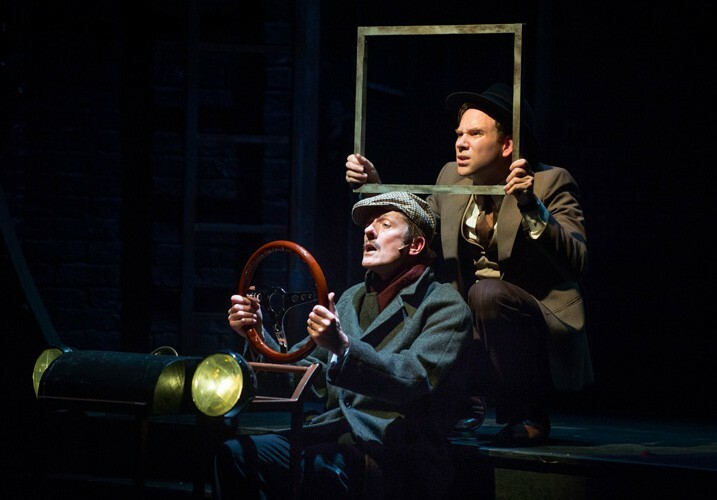 Even if I wasn’t quite able to follow every intricate detail in this production of Partners in Crime, the rapid pace very much helped to maintain interest throughout what was a charming and increasingly hilarious piece of theatre. 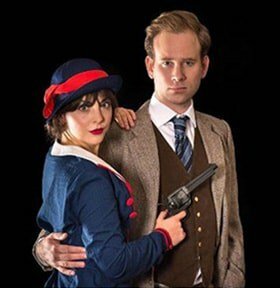 Despite the show’s title, it is actually an adaptation of Agatha Christie’s The Secret Adversary, and not her later novel Partners in Crime. I like to think I was in a win-win situation, having read the latter but not the former, having some familiarity with the central characters Tuppence (Naomi Sheldon) and Tommy (Richard Holt) but still going in with no prior knowledge of the storyline. The long and the short of it is that there is much to be enjoyed. The play includes a few musical numbers, not listed in the programme, which add some delightful actor-musician action to proceedings. What I can only describe as a ‘Money Medley’, incorporating, amongst other tunes, ‘Who Wants To Be A Millionaire’ from High Society and Madonna’s ‘Material Girl’, was a pleasant surprise. How interesting, too, that the programme does not list a character of some importance to the plot – but this being a detective story, and a very good one at that, this appears to be a deliberate act rather than an oversight. Or is it? 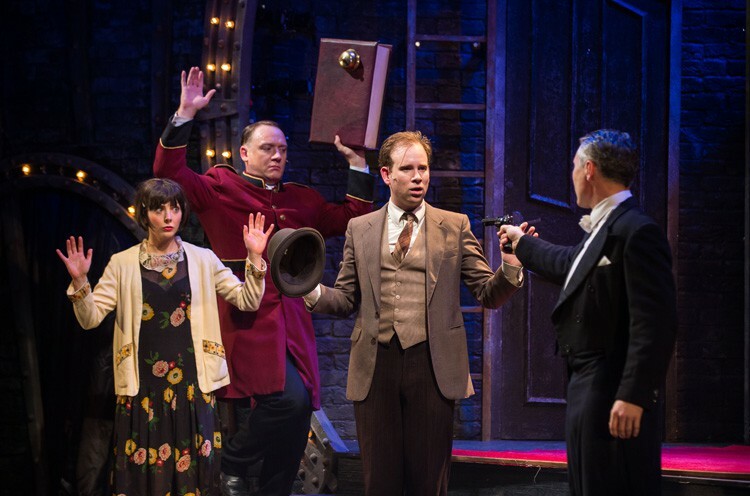 A slightly sluggish start has Sir James (Nigel Lister) explain at length what Tommy and Tuppence are to do, and at the same time the audience gets a general overview, with the details to be unravelled during the course of the play. With the foundations solidly laid, the show takes off at a brisk pace, which does not let up until the end, though there’s some occasional interaction with the audience as we go along, a summary of events, if you will, up to a given point. In almost any other show this may have come across as patronising, almost insulting to the intelligence of the audience, but here it is reassuring, and at least for me, much needed – and much appreciated. 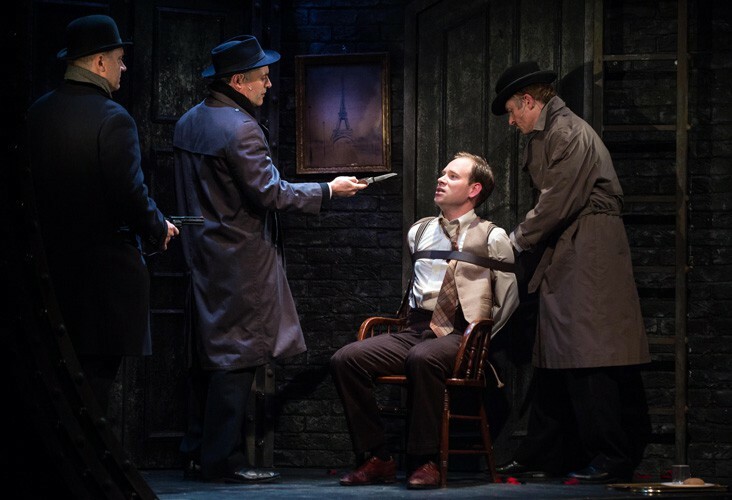 The staging is stunning, with one scene reminiscent of one that features in The Comedy About A Bank Robbery, with an office staged at a near-vertical angle, giving crystal clear sightlines from wherever the audience is sat. Elsewhere, the use of projections is highly inventive, and where videos could have been used, this production chooses instead to have its cast act out even what happens to a ship. Little is left to the imagination as what can be seen through a keyhole, as Tommy continues his investigative work (I trust it isn’t too much of a spoiler to state that an adaptation of an Agatha Christie book involves detective agents), is visible to the whole audience, again without a video and/or animation in sight. This is a quintessentially British play, with the reserved nature of the characters, and the perhaps inevitable ‘farce’ scene with doors opening and closing and people running in different directions with exquisitely precise timing resulting in laugh-out- loud hilarity. There’s even something Shakespearean too in an apology for the limitations of the production (I refer, for instance, to the Prologue in Henry V): apparently twenty actors would have been ideal, but here we must ‘make do’ with eight. The inclusion of magic tricks in the show is a fitting choice, and all of them, I am pleased to report, are executed convincingly. It isn’t exactly for everyone, and arguably the depictions of certain characters are a tad too stereotypical – the most notable thing about an American character, for instance, is that he appears to respond to every situation by brandishing a gun. But overall, it’s very silly, really, and it knows it is, but this is the point – it’s a fun and entertaining evening out at the theatre. Adapted by Sarah Punshon and Johann Hari – A Tommy & Tuppence Thriller.